Marie Antoinette, queen of France from 1774 to 1792. 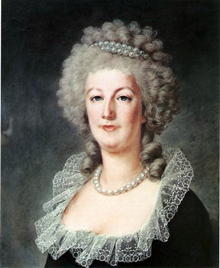 She is famous for having said, upon learning that the peasants of France had no bread to eat, "Let them eat cake." Although famous for this remark, there is essentially no firm evidence that she ever uttered anything like it. "Let them eat cake" is an example of a hurtfully dismissive remark, closely related to "Not my problem." The portrait is in pastel on paper, done by Alexander Kucharsky (1741-1819) near the end of the subject's life. It is currently in a private collection. When we're dismissive towards others, they can experience pain. Retaliation, bad decisions, depressed performance, and broken relationships can follow. Dismissing others might feel satisfying, but it's expensive to the organization. If it's a repeated pattern of behavior, it's a performance issue. Some offenders intend to throw their targets off balance, to inflict pain, or to gain advantage in debate. Others are unintentionally dismissive, but the results can be serious nonetheless. Targets of dismissiveness usually cannot control the behavior of offenders, but they can learn to remain centered. There is a 3-R recipe for dealing with hurtful dismissiveness: Recognize the offense, Reframe the offense, and Reaffirm your own humanity. Recognition begins with becoming familiar with the words offenders use. Because most of the examples below do have legitimate uses, both style of delivery and context determine whether they're being used offensively. For instance, "Forget it," in response to an apology can mean, "Apology accepted." But in response to a request for an explanation, it can be a dismissive rejection. Here's a little catalog of dismissive remarks. Add more as you encounter them. Talk to me later (or sometime). Not your (my) concern (affair, problem, worry). Send me mail on that. [Interrupting] Yeah, yeah, I get it. Oh, that. Let's move on. There you go (she goes, he goes, they go) again. Yeah, I heard that yesterday (last week, last month). I don't think it's quite that bad (serious). You're making (way) too much of it. That's just the way she is (he is, they are). learn to remain centeredchief (pal). I've (we've, you've, they've, he's, she's) done worse. You just can't leave it alone, can you? Nothing I (we, you) can do about that. Would you like to see your comments posted here? rbrenMHjvVyJxvmXpoELzner@ChacoQCVOFHZtjlMdllhoCanyon.comSend me your comments by email, or by Web form. I offer email and telephone coaching at both corporate and individual rates. Contact Rick for details at rbrenwGohahdKHiySQdbGner@ChacnaAaeGrREnPthgqDoCanyon.com or (650) 787-6475, or toll-free in the continental US at (866) 378-5470.